Against a backdrop of misty mountains, St Florent sits at the neck of the Cap Corse Peninsula overlooking its azure gulf. A rugged beauty and colourful history set this region apart and exploring the Désert des Agriates, flower-decked and slate-roofed Nonza or the artists’ haunt of Erbalunga, can be as much part of your holiday as enjoying the watersports or wine tasting in Patrimonio. More French than the harbours of the south, St Florent nonetheless retains much of its Genoese and Tuscan heritage. To complete the picture, we have a collection of handpicked luxury villas in St Florent and Cap Corse to help you make the most of your stay. Until Napoléon ordered the building of the single road that skirts Cap Corse, the promontory – a knobbly finger pointing north to mainland France – was effectively cut off from the rest of Corsica. Beyond the pretty port of St Florent and bustling Bastia at the Cap’s base, the region somehow retains that frontier feel. Such places often engender a sense of adventure; many locals famously set sail from here to the Caribbean colonies to seek their fortunes. And travellers may discover a sense of independence as they navigate dramatic coastal roads and discover unconventional routes to the region’s gloriously remote beaches. From Bastia, Corsica’s second largest city, a single main road runs up the east coast to the island’s most northern tip. From there, it winds its way back down the 40km west coast to St Florent and onwards to Calvi. It’s an exhilarating drive of precipitous drops to sea level and narrow, winding tracks that curve back sharply on themselves to keep you on your toes.The west coast of Cap Corse is famed for picturesque villages perched on rocky cliffs overlooking a wild and rugged coastline of steel-grey beaches. Whereas the east is known for a rather more relaxed air, rolling green hills, sweeping sandy bays and traditional seaside ports. Cap Corse’s 80km-loop of coastline is like a bracelet of wonderfully eclectic gemstones. Exceptionally beautiful, gently shelving stretches of white and golden sands welcome water babies of all ages into their turquoise waters. The adventurous at heart will enjoy wading through rivers, chartering 4x4s or setting sail to discover the clandestine bays and coves that elude the hire car. Between the traditional and the isolated lies an assortment of sandy beaches, shingle bays and rocky, windswept coves. Sleek, upmarket towns are the first port of call for the Provençal jet set. Luxury yachts slide into marinas, an abundance of restaurants provide perfect vantage points for A-list spotting and winding shopping lanes and grand waterfront squares retain a sense of laid-back sophistication, despite the bustle. Away from the buzz, 18 villages are scattered about the fairy tale mountainside carpeting inland Cap Corse. Here you’ll discover a slower pace of life, dramatic forestry and coastal views and diverse architectural styles – Tuscan villas, Spanish haciendas and American colonial palazzi rub shoulders with Baroque churches, pastel cottages and Genoese watchtowers. At the foot of Sant’Angelo, 5km from St Florent, Patrimonio is both the name of a beautiful little village and one of Corsica’s primary wine-growing regions – and Antoine Arena is one of the island’s leading lights. In fact, the former law student has been described as ‘the godfather’ of Corsican wine. For those who love the odd tipple, Niellucciu is the leading red grape in the north and Vermentino whites cut a dash across the island – to be enjoyed in marinas lined with spectacular seafood restaurants and hilltop auberges perched atop rocky, mountainous villages around the coast. Corsican cuisine is defined by the maquis, the dense shrubland covering the island’s rugged interior, which provides rich pastures for snuffling wild boar and rich pickings to fill the larder. Chestnut features strongly in recipes. The fruit of the trees is simmered in stews and made into unctuous sweet spreads and preserves, the smoky, nutty flavour of chestnut flour enhances everything from bread to beer and there’s also a Corsican version of polenta. You’ll find this in the traditional auberge restaurants, a unique blend of French and Italian influences. And even the humble pizza becomes something special when it’s baked crisp in a smoky oven and served with a carafe of ice-cold rosé – look out for signs saying pizzas au feu de bois. There are weekly food markets in most towns and smaller local supermarkets often have aisles dedicated to homemade produce. Cap Corse is a traditional wine-growing region, its vineyards known far beyond the island for their highly scented reds, whites and rosés. As you would expect, pastis is universally enjoyed, but if that’s not to your taste, try the martini-like apéritif, which originated here – Cap Corse. And don’t miss myrte: eau de vie macerated with sugar and myrtle berries from the maquis. Café culture thrives across Corsica, a welcome invitation to join the locals dunking sugar-coated canistrelli biscuits in a café noisette – an espresso topped with steamed milk. Seaside dining is unparalleled on the Cap, with everything from simple beach bars to fine dining and wines to match. The lovely fishing village of Centuri is known across the island for its lobster – try one of the seafood restaurants dotted around the tiny port. The waters of St Florent are among the richest in Corsica and the langoustes, grouper and sea urchins reportedly among the best. Afterwards, you might pick one of the unusual ice cream flavours for which St Florent is also famed. Erbalunga has a good choice of restaurants and the odd Michelin star, whilst Bastia boasts as fine a selection of eateries, while the old streets behind the port house host a local farmers market each morning. A Simpson favourite, this beautifully unspoilt ‘off the beaten track’ beach is a 1km stretch of pearly white sand curving around perfectly clear waters. The easiest route is by boat from St Florent. Or get a boat to Lotu beach and take a 4x4 or walk (50 minutes). For quad bikes or 4x4s, go from Casta village. From June to mid-September, there’s a bar/restaurant just behind the beach. Reserve a table in high season and it’s cash or cheques only. A long, narrow stretch of sand hosting a range of water sports, including windsurfing, sailing, canoeing, jet skiing and scuba diving. The campsites over the road have snack bars. 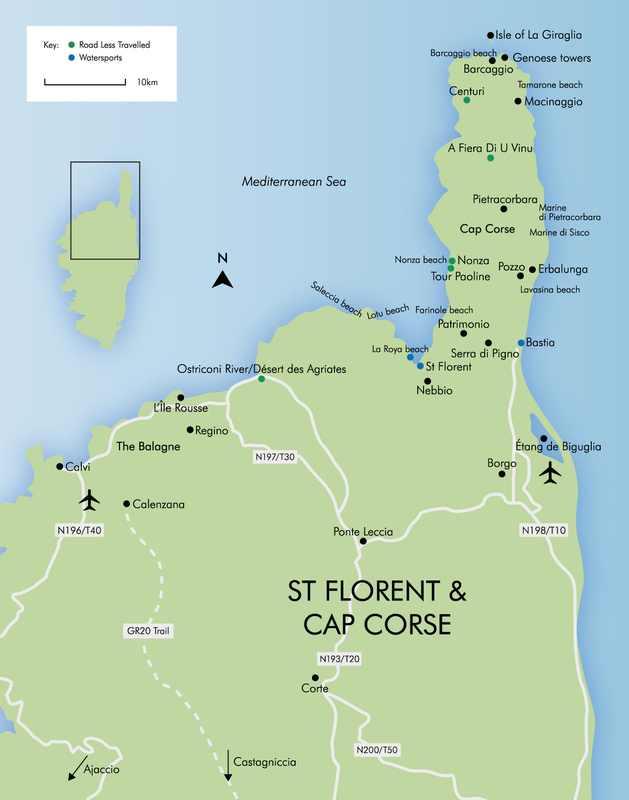 St Florent’s main beach can be reached on foot via the port or by car just west of the town centre. Shallow waters make this beach popular with young families, meaning it can get very busy in July and August. Roadside parking can be found along the main stretch. A fine sandy beach noted for its dramatic sunsets, it’s generally uncrowded and has a small bar and restaurant as well as parasols and bed hire. Located between Patrimonio and Nonza on Cap Corse’s west coast, this little beach is a 15-minute drive from St Florent. Strong undercurrents make bathing unsuitable for children. The waves are popular with surfers – boards are available for those wanting to get involved; or just sit back and watch the action unfold. A long grey pebble beach that’s great for families. Hire a kayak or small boat from the beach bar/restaurant to discover other coves and beaches nearby. Albo beach is 10 minutes beyond Nonza on the west coast, a 35-minute drive from St Florent. There’s a great beach bar for light snacks and gourmet meals, using local and organic produce where possible. This lovely pebble beach has clear blue water for swimming and great mountain views. Situated on the west coast of Cap Corse, Marine de Giottani is about a 50-minute drive from St Florent. There’s a restaurant on the beach and others in the nearby village. Lovely white sand dunes undulate gently down to the sparklingly clear turquoise waters at the most northerly tip of Cap Corse, offering idyllic views of the Isle of La Giraglia. A short walk from Barcaggio village where there’s plenty of parking. 67km from St Florent; 55km from Bastia. Its unsheltered position means that the beach can get windy; there are no facilities so take your own shade. The sea remains shallow for some distance. The narrow coastal road makes for a long day out, but it gives you an overview of where you might want to revisit. Drive from St Florent up the west coast and down the east to Bastia to ensure you’re always in the inside lane. Drive safely! Between mountains and the Désert des Agriates wilderness, this upmarket harbour town is picturesque yet sophisticated. Spend time exploring the citadel and boutiques, relax in a restaurant on the lively waterfront and sample the innovative ice cream. Opened in 1888, this historic toy-train rail route starts in L’Île Rousse and runs along the coast to Calvi. It’s one of the world’s most scenic, albeit rather bumpy! Pick it up in Ponte Leccia to go further afield to Ajaccio, Corte or Bastia in the mountains. The summer concerts and festivals attract a host of international artists. In late July, Patrimonio welcomes guitar enthusiasts from around the world for “Les Nuits des Guitares”, while August sees St Florent’s Place des Portes vibrate with salsa and mambo beats at the Porto Latino. Quad bike trips take you through the Désert des Agriates to the hard-to-reach Saleccia beach, where you can stop for a swim and lunch. Biking trails are also a great way to discover the remoter parts of the maquis-covered Island. If you can cope with the hills, two wheels and a sturdy pair of thighs are a great way to explore Cap Corse, particularly some of the remote beaches and mountain paths inaccessible to hire cars. Bikes can be rented in St Florent. The area is rich in marine life and scuba diving schools in Bastia and St Florent will be happy to introduce you. The rocky coast has also claimed a few wrecks; the Calvi diving schools organise trips out to a WWII B-17 bomber. Motorboats can be rented by the hour or the day from the major ports, towns and beaches, and allow you to explore the coastline, reaching beaches inaccessible by road. For boats over 6hp, a skipper’s licence is required. For golfers, there’s a nine-hole course in Borgo, on the road to Bastia airport, with numerous out-of-bounds, bunkers and water hazards. Weekends are best avoided and book ahead. There’s another nine-hole course in Regino, about an hour’s drive from St Florent. Whit Monday, a public holiday that takes place on the first Monday after Pentecost (50 days after Easter). The village of Luri hosts the annual wine fair, where local winemakers invite you to sample their wares. Calvi on the Rocks Music festival. Bastille Day, public holiday. A nationwide celebration to commemorate the French Revolution with various parades and fireworks. Les Nuits de la Guitare, Patrimonio. A guitar music festival attracting string enthusiasts from around the world. The tiny fishing port of Erbalunga on the east coast puts on a lively jazz festival. Porto Latino, St Florent. Series of live concerts celebrating Latin music, attracting international artists. The Assumption of Marie is celebrated with a big firework display in Calvi. In the pretty village of Nonza, you’ll find a museum celebrating Corsica’s native cédrat, rather like an oversized lemon. Not to be eaten raw, it’s used for jams, confits and liqueur or oven dried and dipped in dark chocolate. Nonza is also home to the Sainte Julie chapel, a listed monument, which houses the relics of the martyred saint. Across the road, you can look down on the unusual black sand bay. Photographers will find inspiration in the almost lunar-looking mountainous area between St Florent and the mouth of the Ostriconi River, known as Désert des Agriates. There isn’t much to do here and that’s the appeal. Stop off on your drive through to stroll among wild goats and the pretty flowers of the maquis that spring up in early season. On a clear day, there are views across the whole Cap. Wine is a reason to celebrate here, particularly at Luri’s Fiera Di U Vinu in July. It’s the most important get-together for Corsica’s wine growers and a chance for them to show off their most elegant tipples. And because wine is best with food, there are also plenty of local delicacies for nibbling. If you miss this event, the village’s wine museum is open all season long. Drive out to beautiful Centuri on the most western point of the Cap Corse, and discover a tiny port reminiscent of a Cornish fishing village. Sip a coffee on the harbour as you watch the colourful little boats come in and out, meander around the picturesque streets, and don’t leave without trying the lobster for which this beautiful little village is famed. The Tour Paoline has enabled its occupants to keep watch over the Gulf of St Florent since the 16th century. In the ancient village of Nonza, this 167m-high watchtower is accessed via a climb to the top of the cliff overlooking the famous black beach. It now houses a craft shop, but still provides one of the island’s most stunning sea vistas.